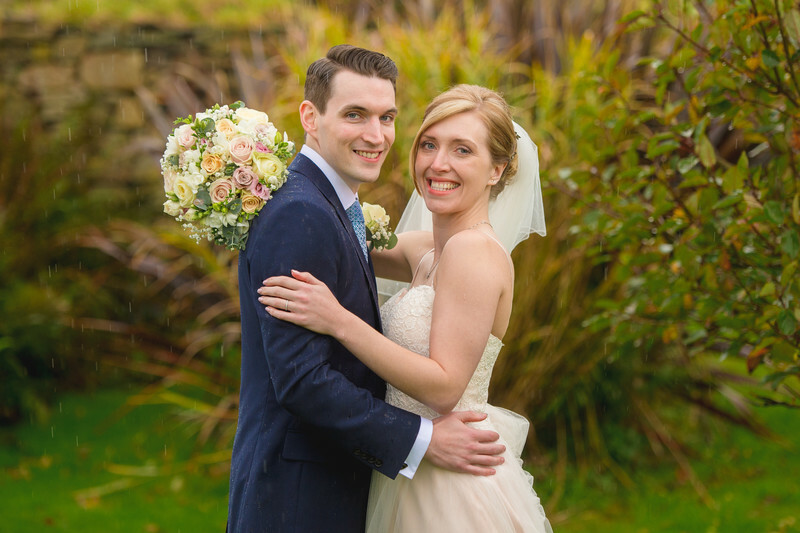 Rachel and Dan are both Worcestershire born and raised, but instead of sticking with tradition and having their wedding near the bride's or bride's parents home address, they instead chose to elope (a little) and get married in Cornwall instead. When I heard I had been asked to photograph a wedding at a luxury barn conversion, in the rolling Cornish countryside, I imagined a wonderfully sunny day, blazing sunshine and temperatures in the high twenties. Of course what I imagined, as it turns out, couldn't have been further from the reality. I arrived in Cornwall the day before the wedding as I hadn't worked at the venue before. If you've read my FAQ, you'll have seen that I always visit a wedding venue at least once before a wedding, especially if I've never worked there before. This allows me to get a feel for the venue, workout where I'm going to get the best possible photos and generally better understand how the wedding day might go. All was well on arrival, the weather was fine, it was warm, there wasn't any wind and everyone was in really high spirits. To make things even better, in the suite that had been provided for me by the family of the bride, with it's beautifully appointed kitchen and bathroom, both with heated floors, the venue had left me 6 freshly made Cornish scones with extra thick clotted cream and freshly hand made strawberry jam. I was pretty sure I had died and gone to heaven! I went to bed that night thinking about the locations I'd use for all the various photos that I had planned, and was really looking forward to the following day. I got to the bride's suite the next mooring at 0700, in order to capture photos of everyone getting ready from the very start of the day, and I couldn't get over how much the weather had turned. It was freezing, pouring with rain and blowing an absolute gale. The wedding ceremony took place in a stunning converted barn, that would be open on one side if not for a marquee that looked out over the countryside. During the wedding, the marquee was being blown about and you could see the rain pouring down the windows and I knew that I had my work cut out for me that day. Luckily there was a wide open indoor space that allowed me to take the formal wedding photos of the bride, groom and their families and friends, but when it came to getting some photos outside, things were going to be tricky. The bride and groom had a fantastic attitude - that they're only going to get married once, and why not make the most of the situation? Even though the rain was torrential and coming in sideways. I had a quick look in the back of my car and found a mountaineering coat in there, meaning at least I'd be dry for the few minutes that we were out taking photos. The best man borrowed umbrellas from guests and the wedding venue itself, and we quickly made our way into the garden. I stood the bride and groom where I worked out would make for a nice photo, and when I had dialled the correct settings into the camera, I shouted for the best man to jump out of the photos (he had been holding umbrellas over the couple) and I snapped a few shots, before allowing the best man to jump back in. The photos are wonderful, and it's great to see such authentic smiles on the couple. They even decided to walk the 50 or so metres back to the wedding venue without the cover of the umbrellas so I could get some nice casual shots of the couple. Against a relatively light background, it can be quite hard to see rain in photos, but there's plenty visible in this one. Still, look how happy they both are! I love it when my clients adopt this attitude. After all, it's get a little cold and wet or not have any wedding photos outside!